Shown are bench mounted laboratory systems designed for a client who required plant to continuously filter large volumes of water, in some cases up to 1000 litres. The problem was solved by producing an automatic vacuum filtration plant. The plant is connected to the water requiring filtration and to drain via a built in manifold. One chamber is evacuated and draws the water through the filter. When the level reaches a sensor the plant automatically changes over to the other chamber without pause. The first chamber is vented and the contents pumped to drain. The process is then repeated. The entire process is PLC controlled, and the programme cycles all valves and pumps without any operator input. The plant can be supplied with a DVP Water Resistant (WR Range) vacuum pump. 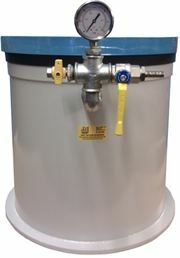 We also manufacture a range of Vacuum Resin Degassing Chambers.